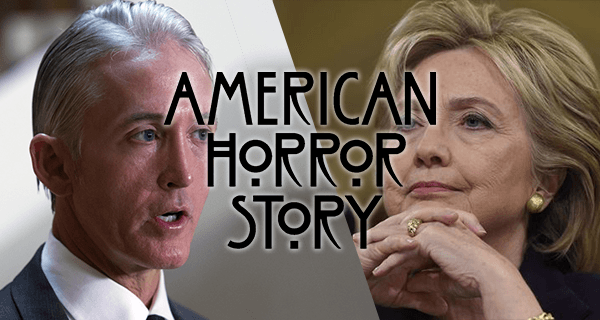 Millions tuned in on Thursday to watch the most highly anticipated episode of American Horror Story yet. While its fifth season has been off to a rocky start, the show’s most recent boundary-pushing spectacle has brought back the intrigue and gore that titillated fans during its first. The last few seasons have left fans widely disappointed, but today’s gruesome marathon of terror skillfully combined the most captivating elements from past story arcs: bloodlust, witch hunts, circus freaks, demonic possession, and women over the age of 50 with flawlessly coiffed hair. In addition to inspiring awe, the impressive weaving together of previously disparate elements has strengthened the popular theory that all AHS seasons take place in the same universe. However, the most thrilling balancing act was that performed by the episode’s star, Hillary Clinton, who simultaneously performed contortions and tightrope routines rivaling those in season four, Freak Show. Despite the flood of praise, some critics argue that today’s episode was yet another example of director Ryan Murphy featuring too many villains to focus on at one time. The ghastly appearance of “a large pile of emails” was also criticized for being distractingly over-stylized. Still, the majority of reviewers seem to agree that today was a masterful reimagining of the horror genre. In the weeks to come, all eyes will be on Murphy to see if today’s success was a fluke or a preview of television’s most fancifully macabre season to come.